SHOULD WE MENTION TOM PETTY'S PASSING, HE PLAYED BASS IN THE WILBURY'S? A very talented musso but not my cuppa tea. A sad loss never the less. Liked some of his stuff, disliked some of this stuff, but loved his bass work with the Wilburys. 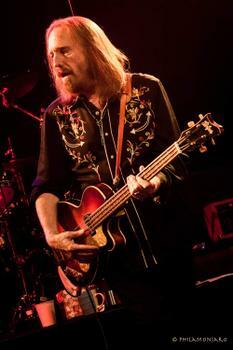 Tom Petty should be mentioned not because he was a bass player once, but because he's Tom Petty. Fan or not, you can't deny the man is one of the most recognizable and respected rockers of the last forty years. I personally didn't like ALL of his stuff, but what songs of his I did like, I liked quite a bit. I've had a few of his songs on my to-do list for a while. Sorry to admit it's taken him passing away to remind me. So that's a yes then. I only heard the songs of his that were played on the radio and I liked them, but not enough to rush out and buy his albums, I always sing along (badly) to Freefallin, so he did something right. Sad loss. I found it hard to single out one person's death on the same day 59 others were gunned down. I wasn't a huge fan, never bought any of his albums actually. But I did like a lot of his music. I also found his satellite radio channel refreshing to hear something that wasn't so mainstream and over played. And all 60 had expectations of seeing the next day, which makes it worse. But surely, isn't it every mans right to bear arms? It's in the 230 year old constitution ffs, where wild animals and even wilder natives were rampant! If only our Founding Fathers had a little more foresight they would have protected our right to play bass!